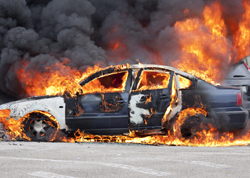 Noticing a fire in your car while you’re driving it is terrifying, but you can minimize the damage done to yourself and others if you act quickly and try not to panic. Keeping a cool head in this hot situation could save your life as well as anyone else’s in the vehicle. First, signal right as quickly as you can and pull off onto the shoulder or into the service lane. If you’re signal isn’t working, blare the horn, wave your hand out the window or do whatever else you can to get other drivers’ attentions and get them to move out of your way. They may pull over to help you or at least get out of your way as quickly as humanly possible. Once you’re in the service lane, immediately switch off the engine and get yourself and everyone else out of your car. Don’t worry about grabbing your purse or even your cell phone, and don’t try to go for anything in the trunk or glove compartment. You never know when the car may burst into flames or even explode so walk far away from the car and keep everyone at a safe distance. Do not try to go back for something left in the trunk or in another part of the car that might not yet be touched by flames. As you won’t be able to switch on your emergency lights, try to discourage other motorists who stop to help from parking near your car. Usually the flames are enough of a deterrent, but in situations where the smoke isn’t as noticeable, you may want to try and notify people It may be difficult to have a perimeter set up, but if another car does pull over, ask them to back up and turn on their emergency lights. Call the fire department and do your best to keep any onlookers or passing cars away from your vehicle. Do not attempt to put any flames out yourself, and if you only see smoke and no flames, do not try to get back in the car and restart the engine. The flames might come into contact with the gasoline in your tank, which will cause an explosion. Stand far away from the vehicle and wait for help to arrive. As with any car accident, remember that personal property can be replaced. People and loved ones around you cannot.